In their first collaboration, Liam Gillick and Louise Lawler stay within their comfort zones but manage to nudge us out of ours. Their familiar methods of institutional critique (photographic in Ms. Lawler’s case, sculptural for Mr. Gillick) combine to form a dynamic, disorienting installation. 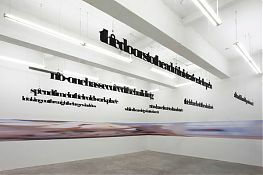 Mr. Gillick’s contribution is a text piece composed of cutout aluminum sentences, which hang from the ceiling in neat rows and lure readers deeper and deeper into the gallery. Gradually, it reveals a vague and halting narrative about workers at a defunct factory (the Volvo plant in Kalmar, Sweden, as the news release tells us). Ms. Lawler contributes a striking background, a long vinyl wall sticker that links the three rooms of the gallery. The image printed on it is a stretched-out version of some of her earlier photographs of artworks in bland white-box settings; here, pieces by Degas, Richard Serra and Gerhard Richter, among others, are distorted beyond recognition.